I may be a bit obsessed by time. I do have a bit of a penchant for clocks and watches, so being in Switzerland I’m like a pig in muck. Everywhere you turn, clocks and watches. But it’s not like I have been taking loads of pictures of the clocks on this journey. Ok, maybe I have. I think it may stem from spending most of my life in broadcasting. Even when I was doing hospital radio we had to time jingles to the second so we could seamlessly cut into the IRN news without anyone realising that we were nicking off a local radio station. Then when I began broadcasting proper (as in I found someone daft enough to pay me for the privilege) it was all about “hitting the pips”. At Radio Lancashire I used to have a radio controlled clock sat in front of me at Lancs Police Headquarters and as I was doing my travel reports into the breakfast show it would go “Andrew Fenner, BBC Radio Lancashire Travel (beat) beep, beep, beep, beep, beep, beeeeep”. Back of the net! I did a little air punch every time I got this spot on (much the derision of the police officers sat next to me). Ok, maybe I have. Anyway, we have spent a fair amount of time this trip looking at clocks. The first was in Prague. People had told us how wonderful it was on the hour. So one day we waited with anticipation to see what happened. Well, on the hour, a little skeleton of death began ringing a bell. Then 2 doors at the top of the clock swung open and 2 faces appeared. For those of you who are old enough to remember Captain Pugwash, because of the way they were animated in 2D, they sort of slid around when they moved? Well it was a bit like that. Then death stopped ringing his bell and the other characters slid back. I was very disappointed. The last brilliant clock that I saw was in Munich and I’m sure that models came out and did the can can or something. This was very poor 5/10. The next clock we stumbled across was in Vienna. It involved models of people moving across a bridge. They had the time above their heads and pointed to the minutes as they went (see picture below). This was quite novel and at 5 to the hour we went back to see what would happen on the hour. We stayed there until the hour. We saw one figure slide off and another one slide in. Nothing. We waited a couple of a minutes. Nowt. We walked away, and as we were walking away we heard it chime…at 4 minutes pass the hour. Very tardy. 5/10. 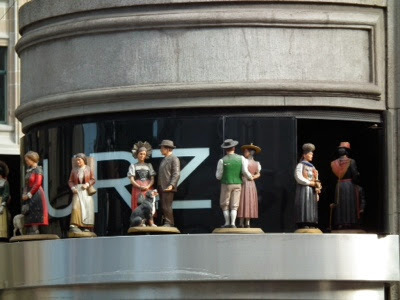 But here in the home of Toblerone and the cuckoo clocks, a jewellers called Kurz came up trumps. This afternoon, at 4pm their clock (which is actually quite plain) came to life as a dozen or so charchers came out, twirling, dancing and smashing beer steins together accompanied by a peel of bells. At last. A clock to be proud of. 10/10.